In 2014, a team of developers, engineers and scientists gathered at CERN, the European Organization for Nuclear Research, located in Switzerland. This group of experts brought ProtonMail to life in response to the growing concern regarding the threats to privacy that affect internet users around the world. After launching ProtonMail, a highly secure email service that focuses on keeping communications private, the team followed up with ProtonVPN, a solution that aims to provide a higher and more comprehensive level of protection. Like ProtonMail, ProtonVPN puts emphasis on online privacy and security, delivering a service that is ideal for activists and journalists who need to access information and report news stories, without compromising their own safety. ProtonVPN combines advanced technology and a strong commitment to help people to defend their right to privacy. In this review, we will explore ProtonVPN and will find out more about the features that make it a solid choice to protect your privacy and fight for your freedom to access information online, without facing censorship. ProtonVPN supports OpenVPN and IKEv2/IPSec, which are protocols that stand out thanks to their security. Since PPTP and L2TP/IPSec are no longer considered as reliable options to protect data, it is not a surprise to see that ProtonVPN has left them out. OpenVPN and IKEv2/IPSec are protocols that can still be trusted when it comes to keeping your information secure and private. In addition, ProtonVPN uses top encryption to ensure that your internet traffic is fully protected. Your online data is encrypted with AES-256, 2048-bit RSA is used for key exchange, while message authentication is handled using HMAC with SHA256. Perfect Forward Privacy is supported, which means that encrypted traffic cannot be saved and decrypted at a later stage, in case the encryption key from a future session is compromised. A new encryption key is generated with every connection, guaranteeing that a key is only used for a single session. Another thing to note is the Secure Core feature (which we’ll discuss further in the Features section), which is designed to give users the chance to establish a multiple hop VPN network path to offer increased privacy protection. The Secure Core servers are located in a former Swiss army fallout shelter that is 1000 meters below the surface. Other servers are also operating from locations that are highly secure. In summary, ProtonVPN looks after security, not only when it comes to its software, but also at the hardware level. When you use ProtonVPN, your browsing activities are protected and so are your DNS queries. ProtonVPN routes your DNS queries through its encrypted network, instead of using third-party DNS providers. This prevents your browsing activity from being compromised. During our tests, we confirmed that there are no leaks from DNS queries that could put your privacy at risk. The tests also showed that your real IP address is masked, meaning that you will be pretty much untraceable. All servers tested successfully passed IP, WebRTC and DNS leak tests. ProtonVPN has VPN desktop clients for Windows, macOS, Linux, as well as mobile apps for Android and iOS devices. The dedicated software allows you to install ProtonVPN without hassle and only in a few minutes, but there are also tutorials that will guide you through the process of setting up the VPN manually. But first things first, to get started, you need to create an account, if you have a ProtonMail adddress, you can use it to register. Once you access your account, you will see the ProtonVPN dashboard, which displays all the features available. You will find information such as your current IP address, the Quick connect button and the Countries tab, which shows a list of server locations available. The session traffic graph lets you see the upload and download speed of your current connection. You can also adjust the settings and manage your preferences to enjoy a personalized experience with ProtonVPN. The client lets you create and manage profiles so that you can save your favorite connection settings. Thanks to the built-in kill switch, your real IP address will remain protected even if the VPN connection drops unexpectedly. All the network traffic will be blocked to ensure that your privacy is not compromised. The Always-on VPN feature automatically reconnects you to a VPN server. These two features work together to keep you protected at all times. ProtonVPN also allows you to connect to selected Tor servers so that you can route your entire traffic through the Tor network and browse the internet anonymously. You will also be able to get access to Onion sites, with just one click. Then we have the Secure Core network, which gives you the possibility of increasing your security. It encrypts your traffic by routing it through multiple servers before it gets to the final VPN server and leaves ProtonVPN’s network. With Secure Core, others won’t be able to see your real IP address, or track you. The Secure Core network’s servers are located in Switzerland, Sweden and Iceland, which are countries with strong privacy laws. ProtonVPN manages these servers, meaning that it has greater control over their security. The exclusive Secure Core infrastructure will protect you against network attacks and it offers a level of defense that you won’t get from other VPN services. The Iceland edge server supports end destinations such as Brazil, Canada, Ireland, Israel, Norway and Spain. Sweden supports Finland, South Africa, Japan, Hong Kong, France, Australia and more. Through the Swiss Secure Connect server, you can connect to servers in Canada, Netherlands, Denmark, Czechia, United States, Austria and United Kingdom, just to mention a few. Security is covered, but if your main concern is bypassing restrictions and enjoying a versatile streaming experience, you’ll be glad to know that ProtonVPN offers a feature that focuses on ensuring that you can stream content securely and without annoying delays. With Secure Streaming, you will be able to access your favorite content from any location. The standard network offers hundreds of servers in 31 countries including Switzerland, United States, Iceland, Singapore, South Africa, Canada, Finland, United Kingdom, Japan, Sweden, Spain, Ireland, Germany, Czechia, Ireland, Brazil, Australia, India, New Zealand, Denmark and South Korea. Keep in mind that the servers that can be accessed, depend on the plan that you are subscribed to. The Plus and Visionary plans, which we’ll discuss in the next section, give you access to the dedicated faster servers and the Secure Core VPN network servers. Most locations support P2P and the speeds that you can enjoy on the Premium servers, are perfect for downloading or streaming content. If you use the Secure Core feature, you can expect a drop in the speed, but this is due to the high level of encryption used. Overall, ProtonVPN offers fast performance across its entire network and all paid plans offer unlimited bandwidth and high speeds. ProtonVPN successfully unblocked Netflix US, HBO, Hulu and more streaming and live TV platforms across other countries. The server speeds remained very high on a 200Mbps line, allowing for multiple high definition streams to be used on a single connection if needed. Overall good performance for this type of application. Although we did not detect any DNS or IP leaks, it is important to clear your cache and cookies, as well as log off from public email accounts before attempting to unblock restricted content that attempts to detect VPN users, or else you might still be blocked due to historical cookies from your browser. ProtonVPN offers a free plan that gives you the chance to connect to servers in 3 countries, while using one device. With this plan, you can add protection for your general browsing, but the speeds are low. 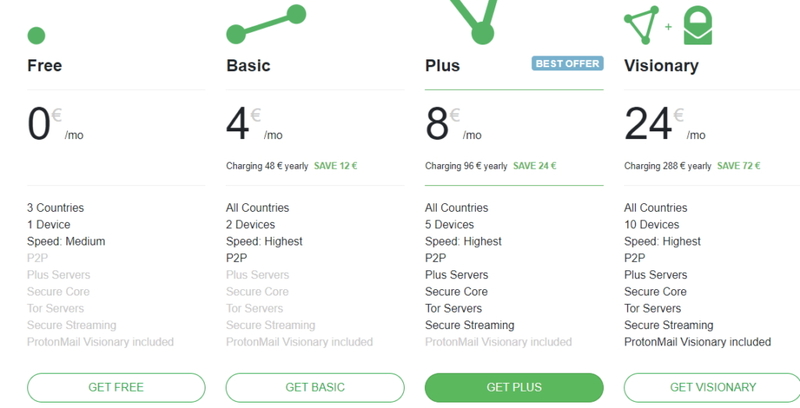 If you want to get all the advantages of using ProtonVPN, the best option is to get a paid subscription. There are three premium plans available: Basic, Plus and Visionary. The Basic plan costs $4 per month, the Plus plan costs $8 per month and the Visionary plan is priced at $24 per month. If you pay for one year in advance, you can save money and get the best deal. The main difference between the plans is the selection of features supported and the amount of simultaneous connections allowed. The Basic plan supports two simultaneous connections and gives you access to all the servers in the standard network. The Plus plan lets you connect up to five devices at the same time and it gives you access to all the standard servers, as well as Plus servers, the Secure Core network, Tor servers and it also supports Secure streaming. The Visionary plan offers all the features of the Plus plan, but it supports up to 10 devices at the same time. It also includes ProtonMail Visionary, which is the advanced version of the end-to-end encrypted email service. This plan could be the best solution for large households or small businesses. All paid plans offer P2P support and High speed, but the Plus and Visionary plans are recommended due to the added features and security that they support. There is a free trial that allows you to enjoy the premium service for 7 days. All major credit cards are accepted as method of payment and you can also pay with PayPal. To keep your identity protected, Bitcoin can be used as a method of payment. The website has a support section that offers general information about the service. There are also setup guides, troubleshooting tips and important details that will help you to get out more out of ProtonVPN. The information in the Support section is well-organized and you can easily find what you are looking for. The team can be contacted via web form (email based), and they also have profiles on Twitter, Facebook and Reddit. Their responses are prompt and efficient and they provide a lot of detail. ProtonVPN is an excellent choice for people who want the highest level of privacy and security. The free service is slower and it comes with some limitations, not to mention that it may be difficult to get a free account. This is why it is advisable to upgrade to a premium plan in order to take full advantage of everything that ProtonVPN offers. The advanced security features and the good quality of the software make ProtonVPN a solution that deserves to be considered. It offers all the necessary options to protect your privacy and to bypass restrictions.